​ "Bryan, Just came across your website which I think is a remarkable and fabulous compilation of Joan Crawford in her later years which was when I too became enamored of her and her work. 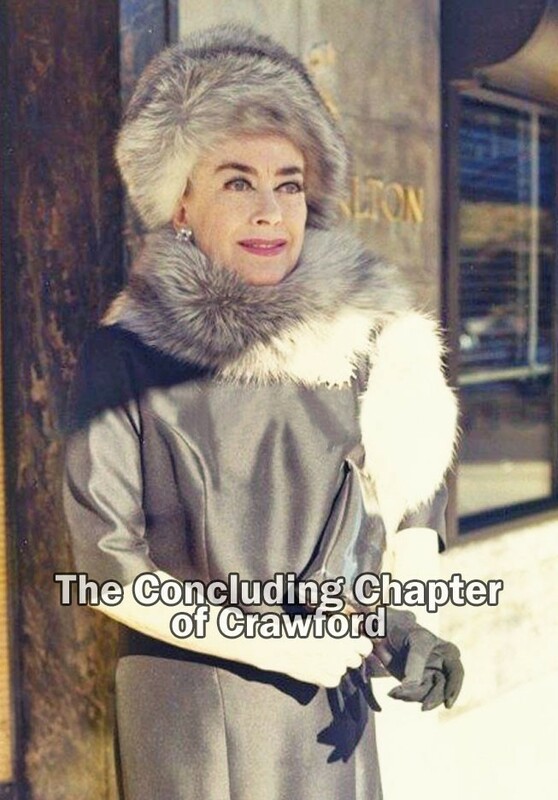 On November 16, 1971 Joan Crawford's book signing took place at a store that used to be called "Jordan Marsh" at 2:00 pm. I know this because I was 14 at the time and begged my parents to bring me in which they did for the book signing. I was 14 years old wearing an orange a-line dress lined in faux fur at the collar and cuffs. My father wanted to bring a camera I begged him not to - a request I regret to this day. ​I was second in a long line of fans to meet Joan behind a very eccentric old woman dressed in a gothic floor-length black dress carrying a dozen roses. Joan was seated on a raised platform at a table with who I now believe was Christina. ​​I remember this odd old woman in front of me because when she got to Joan, she handed over the red roses, made a deep courtesy and disappeared. She never spoke to her never asked for an autograph just took off. I recall the handlers around Joan thought it was odd and scrambled a bit as well, but they moved the line on to meet her. ​Joan stayed at what was formerly the Ritz Carlton on Boston Common, now the Taj where she gave a press conference and I have that clipping somewhere. Very interesting as the reporter noted the room was absolutely frigid at Joan's request and stocked with Pepsi products. When I arrived at the elevated platform where the table was located to meet Joan, I told her that I had many letters from her which now I realize were written by Betty Barker from the West Hollywood address you note on your website and sent to her to be signed in NY then mailed. ​My mother got the address as she sent a letter to Brandeis asking them to forward her letter to Joan as I was such a fan. ​​ Joan was beautiful, gracious and surprisingly short in stature. I remember I was stunned by how blue her eyes were as she wore a black mink hat that covered her hair, a black empire waist dress and at the waist a beautiful diamond broach centered at the cinched waist. ​She stood up to meet me. She wore a perfume on her hands that lingered when she shook your hand. When I gave her my name, she said she remembered me and appeared sincere. I had begun training as a singer at that time and went on to have a minor operatic career. I now work for the Boston Symphony Orchestra. ​ She was incredibly gracious, in the moment and focused directly on me. It was a very intense experience. ​As I was by far the youngest fan in line, this was a tremendous photo opportunity as I see now in retrospect, the fact that a teenager came to meet her spoke to her powerful outreach and impact. She leaned over and said to me, "would you like to give me a kiss?" I said "yes". Again I am aware she was looking for the photo op - a product of fantastic MGM studio training. ​She leaned over and all I heard were cameras clicking. To this day I have searched AP sites and photo libraries to find the photo of that moment. She wished me good luck in my career as I was professionally singing in musical theater at that time and asked that I continue to correspond with her. It is a moment of my life I will never forget."